The charred bits of the grilled asparagus will taste amazing in the risotto, and the butter and Parmigiano in the end will create a fantastic creaminess. Barbecue season is here, can you tell? I made asparagus risotto many many times in Italy, but I never thought about grilling the asparagus on the barbecue. Until my husband came in the picture…he is a bbq fanatic, we’re barbecueing almost everything edible… 🙂 . 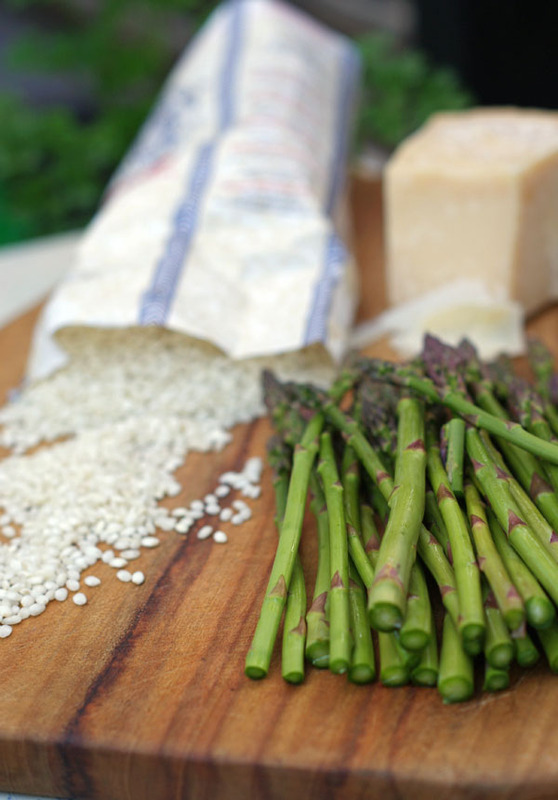 The ingredients are fundamental: organic asparagus from Edgar Farms bought at our local Farmers’ Market, Vialone Nano IGP rice and Parmigiano Reggiano DOP aged 36 months that I brought from Rome when I came last. 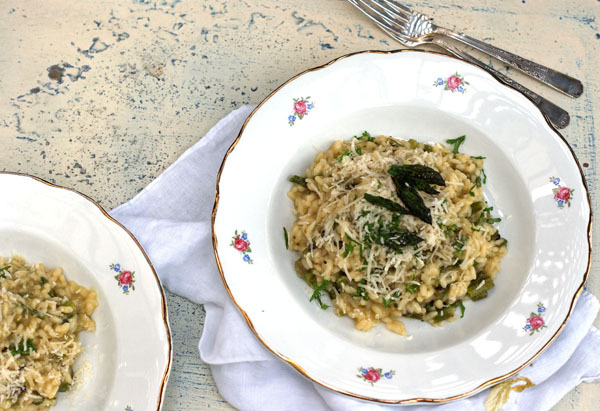 We found the rice at The Italian Centre Shop, and if you have equivalent specialty shops in your city that carry regional italian products, it can make the difference in the risotto. The rice varieties to make a wonderful risotto are: Carnaroli, Vialone Nano and Arborio, in this order, according to my personal prefence. 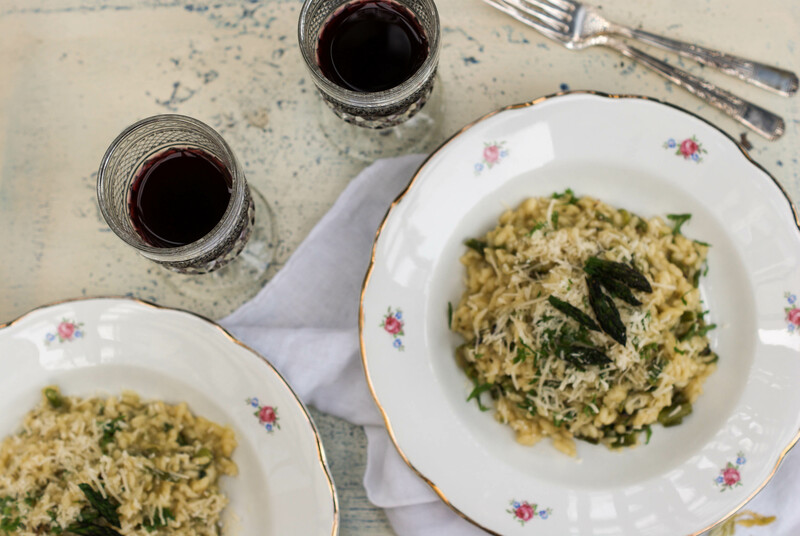 They are all high in starch content and, when cooked, have a smooth, saucelike consistency that gives the risotto its characteristic luxurious creaminess. Here are the grilled asparagus…the charred bits will taste amazing in the risotto, much as to my dismay… Leave some tips that you will add to the risotto at the end for decoration. The starchiness in the rice, the dollop of butter and dusting of parmigiano in the end will create a fantastic creaminess. 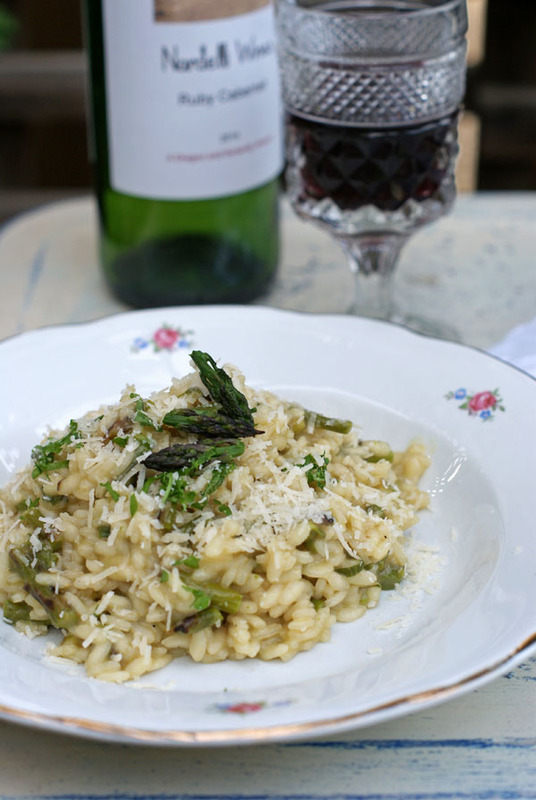 A nice Ruby Cabernet pairs well with this Asparagus Risotto. 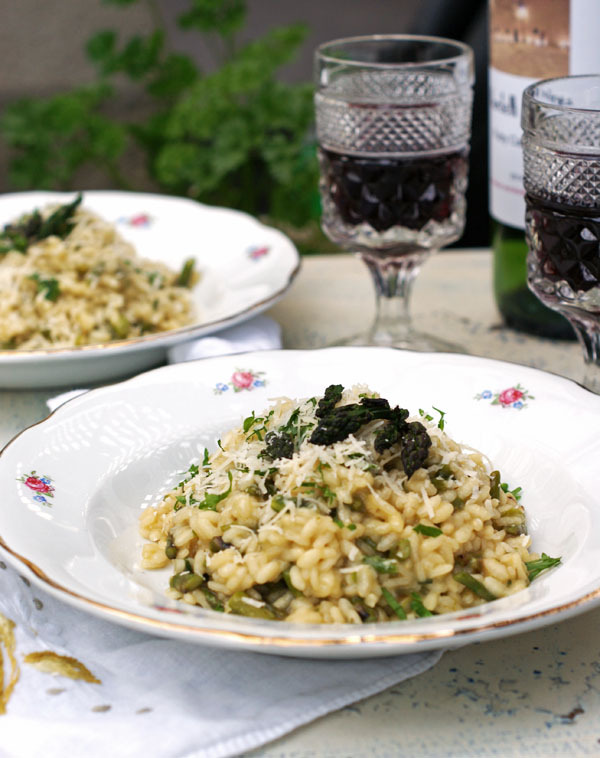 And if you like Risotto recipes, here’s another good one for you: Mushroom Risotto. Wash, trim and blanch the asparagus (about 8 – 10 minutes). 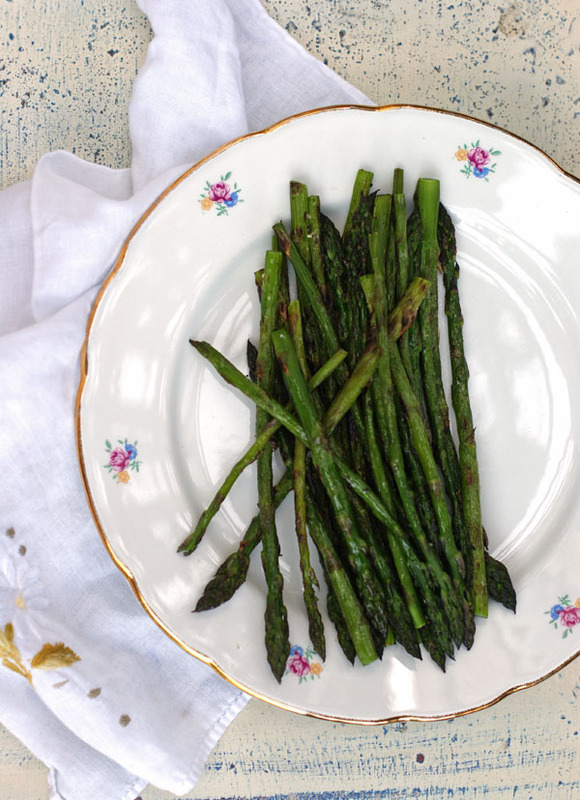 Pre-heat the barbecue to 350° F.
Toss asparagus with extra virgin olive oil, salt, and pepper. Place on grill, roughly 10 minutes, turning on both sides. In a saucepan, heat up 2 tablespoons of olive oil, add chopped garlic and green onion, let sauté till onions are translucent. Add the rice, coat well with the oil. 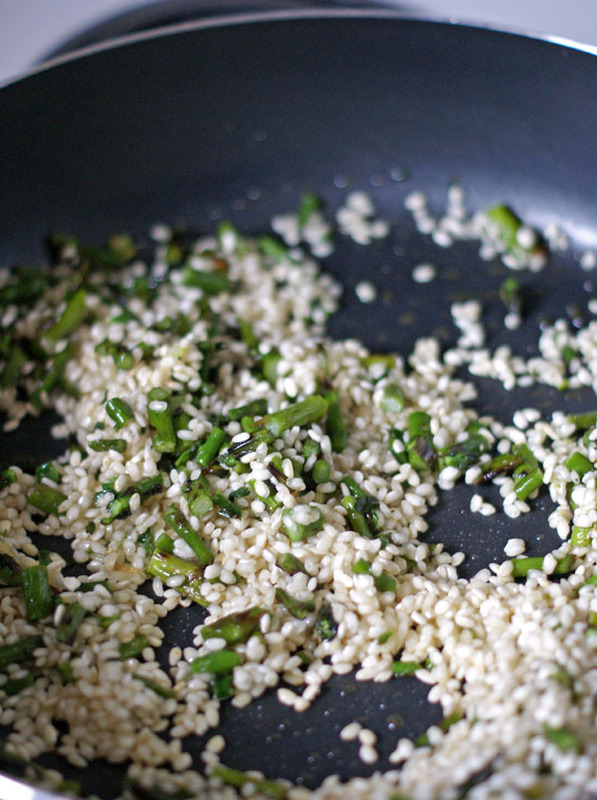 Chop the asparagus, leaving some of the tips for decoration, and sauté in the pan with the rice. Keeping vegetable broth warm on the stove, slowly add 1 ladle at a time to the rice and asparagus, stirring constantly. As the broth dissipates, keep adding more broth, till the desired texture of the rice is achieved (approximately 20 minutes for this kind of rice). Turn off heat. Finish with a tablespoon of goat butter and some Parmigiano Reggiano, leaving some for plating. After plating finish with the asparagus tips, a dusting of Parmigiano and a sprinkle of chopped parsley.